Maraca2 percussion duo are one of Europe’s leading percussion ensembles and have performed as recitalists around the globe, from the Isle of Man to Argentina. 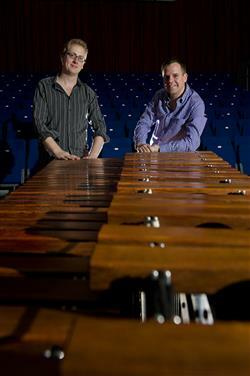 Tim Palmer and Jason Huxtable met whilst studying at the Birmingham Conservatoire where they attained the highest degree classifications and now teach as tutors of mallet percussion. Maraca2 perform regularly at percussion festivals worldwide and have appeared as artists at all the major events including the Percussive Arts Society International Convention in Indianapolis, the International Marimba Convention in Minneapolis, the Fundación Cultural Percussion Festival in Argentina and Royal Northern College of Music Day of Percussion in Manchester. They have performed around Europe at festivals and music events including a recent televised live concert in Belgrade with the RTS Orchestra. Their media appearances also include coverage on the BBC including a live performance on BBC Wales. Maraca2’s 2013 engagements already include scheduled trips to Argentina, Croatia, Las Vegas, Utah, Missouri, Tenerife, Puerto Rico and France. As one of Europe’s most commercially supported ensembles, they endorse Sabian Cymbals, Innovative Percussion and Marimba One marimbas. The range of events the duo have presented since their inception has been notable in its variety with performances in traditional recital settings, on classical themed cruises, at fashion shows and at football clubs .... the list goes on! Maraca2 were commissioned by the European Indoor Athletics Championships to write music and perform the Opening Ceremony at the National Indoor Arena, UK which was broadcast to a mass audience on Eurosport worldwide. Maraca2 have completed two successful long USA Tours in 2009 & 2011, educating in excess of 500 Students at over 20 Universities and plan another 2013 tour to Missouri, USA.